"There's no such thing as a new visual idea. There are only an infinite amount of variations of very good existing ones"
Any material can be made into a piece of art. And this is especially true with Brazilian artist and photographer Vik Muniz. 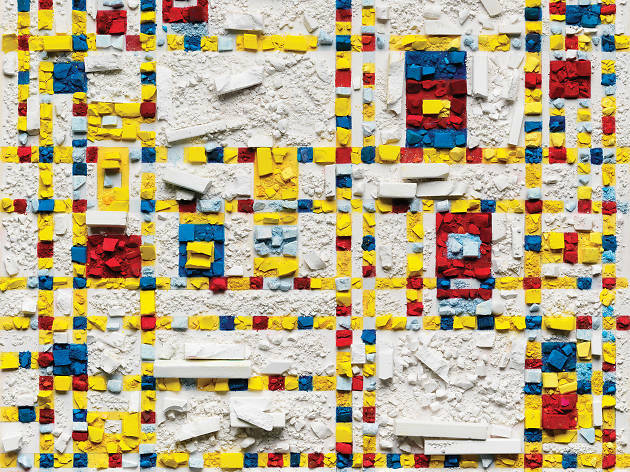 Famous for employing a diverse range of materials in his creations, Muniz has made a career out of using unconventional resources like dust, litter and even chocolate. For his new exhibition, Metachromes, in Central’s Ben Brown Fine Arts gallery, pastel chalks are the stars of the show. The artist uses them to create colourful compositions and recreate iconic images in art history including works by Van Gogh and Paul Cézanne. Born in São Paulo, Muniz splits his time between New York and Rio de Janeiro. Throughout his career, he’s been widely known for reimagining iconic paintings before photographing the end result. Most famously, he recreated Andy Warhol’s Double Mona Lisa using materials that more conventionally go on bread instead of canvases: peanut butter and jelly. “I work with a variety of ‘non-artistic’ materials to illustrate the effects of the process over the meaning of images,” Muniz explains. “I want to get the viewers back in the game of looking at things and to re-insert filters that once were so very important for our process of understanding the world through symbols.” By reworking Warhol’s original piece, which was already an interpretation of Leonardo da Vinci’s ultra-famous painting, Muniz examined notions of appropriation and recontextualisation. Aside from his reputation for a love of mundane materials, some people may be familiar with Muniz’s role in the Academy Award-nominated documentary Waste Land in 2010. The film follows the artist as he travels to one of the world’s largest rubbish dumps on the outskirts of Rio. 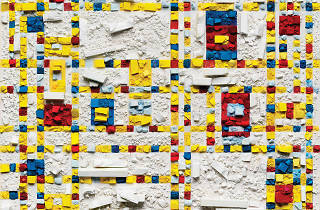 He creates large-scale arrangements from the trash and photographs them. They eventually make their way into prestigious auction houses in London. Clearly, Muniz has to the potential to literally turn rubbish into gold. For Ben Brown Fine Arts’ inaugural 2017 exhibition, Muniz makes chalk and pastel sticks the subjects of his creations. Presenting photographic representations of his works, each of the canvases consist purely of these materials in different forms. From using entire pastel sticks and stubs to broken fragments or even mounds of dust, Muniz is both utilitarian and creative in the ways he explores a single material. His choice of vibrant colours and the way he meticulously pairs up contrasting hues side by side places the spotlight on the materials themselves. And Muniz once again recreates artistic masterpieces in this exhibition using chalk and pastel sticks. “There is no such thing as a new visual idea,” says Muniz. “There are only an infinite amount of variations of very good existing ones. I use other artists’ works that I admire and think that is important as a way to infuse these already exhausted images with a renewed interest and meaning.” The series pays homage to impressionists and abstract expressionists who were once pushing the boundaries of representation and going against the conventional norms. Artists such as Vincent van Gogh, French pastelist Odilon Redon and printmaker Frank Stella are all represented in these works. Also displayed in this exhibition are new works that celebrate French artist Yves Klein and his use of raw pigment in his works. By dusting his canvas with pure-coloured powders, Muniz achieves an incredible textural effect that’s enhanced further in a two-dimensional photograph. Muniz photographs the end product of his compositions but the images on display are not necessarily exact replicas of the artist’s designs. It could be argued, in fact, that they are appropriations of his work. “Photography creates a layer of ambiguity between the image and the observer,” he says. “I don’t want people to become impressed by the thing that is in front of them. I want them to be intrigued by it.” Head to Ben Brown and experience these iconic paintings through your own lenses and re-exmaine how any material you find or pick up has the potential to become a piece of art.